Sure, playtime at the park or playground allows your baby some movement and activity, enhances motor skills, and fresh air, but it is such a multi-sensory experience and can have countless benefits! From newborn to six months babies are very near-sighted and can best see about 12 inches from their face, but distance vision is emerging and any practice looking at their near and far world is beneficial. Around six months distance vision and depth perception emerge. Being outside and having the opportunity to look at things in the distance is so important. Point out things to your baby, “Do you see the doggie over there?” Your baby’s vision continues to refine until well after his first birthday, so getting outside during playtime at the park and perceiving their world from a distance is great practice for his developing eyes. There are so many things in the park to touch and feel. Consider taking off your baby’s shoes and socks and allowing her to go barefoot in the grass or sandbox. Let her touch the bark on a tree or sit in the leaves. Encourage her to touch different textures and ask her questions, “Is that soft or hard, smooth or rough, warm or cold?” This helps to create an awareness about these terms while practicing the sense of touch. Babies are born with no sense of balance, but it develops significantly over the first year. 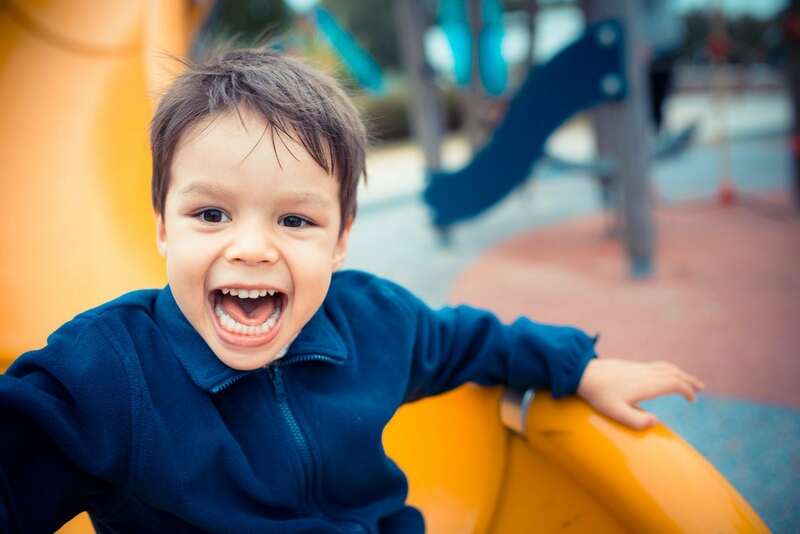 By encouraging playtime at the park and allowing your baby to swing in a baby swing or slide down the slide the movements challenge the balance and equilibrium centers of the inner ear and help to build this important skill. There are so many sounds to hear during playtime at the park. Point out the sounds, “Do you hear the dog barking? Do you hear the ducks quacking?” Does your baby turn toward sounds? Is he overwhelmed by sounds? Does he cover his ears or start to cry? This is good practice for your baby to be in an environment with lots of sounds in the foreground and background to prepare him for daycare, preschool or kindergarten. Use the park as a conversation topic. Talk about the swings, the other children you see, colors, things in nature. Narrate what you and your baby are doing, explain how the spinner works, and ask him questions. The more you talk to him, the more language you are teaching him and because your language serves as the foundation for his language, you are helping him with his future language and literacy skills. Allow your child to interact with other children. Even if your baby is too young to talk, babies love to look at other children. Allow him to get close to other children and play side by side. Encourage older children to interact with other children, teaching them important social skills which helps their own self-concept and self-esteem. Above all, use playtime at the park as an opportunity to bond with your baby. Play together, make her laugh as much as possible and make it fun. The other good news is she will likely get a really good nap later on!